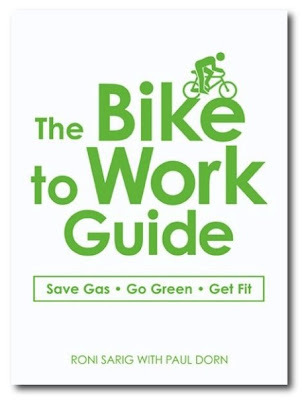 Bike Commute Tips Blog: Bicycle travel, with children too! You bet we are going to be poorer. And public finance is going to collapse, turning transit improvements into pipe dreams even in the minority of American communities where development is dense enough to support them. That leaves large scale bicycling, carpooling, and telecommuting as the short term alternatives for Great Depression II. The former would save on health care spending, too. Traveling with kids is probably the most satisfying experience a parent can have – daily rituals and chores get set aside in favor of spending quality time with the children. 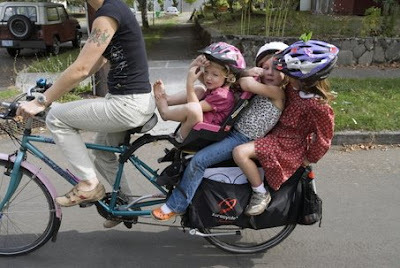 The best part is that you don't need to be an expert cyclist to enjoy a bike trip with kids. I have a Montague folding bike. I can still get around by bike, sometimes the kids can too, but when it comes to moving the kids (esp. in bad weather), sometimes I still take them in the car - bike folds right up and into the trunk.